Free games: Win a Steam key for iconic arena shooter Quake Champions! Quake is well-known for establishing the blistering and unforgiving brutality of the multiplayer arena shooter more than 20 years ago now. 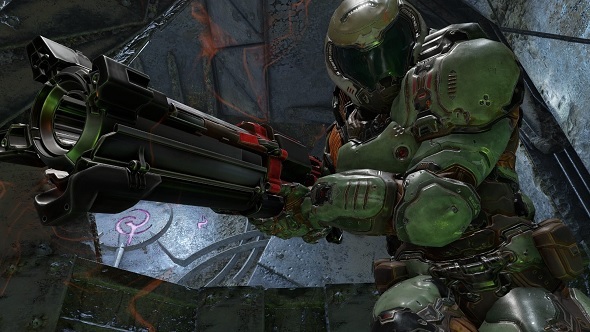 While time has flown by – like a rocket whooshing past your cheek – Quake has remained stalwart, still as thrilling to play now as it was back then. The main difference is that the original game has some younger, better-looking siblings now, and the latest of them is known as Quake Champions. As the title says, the next great Quake game changes up the heat of battle with the introduction of Champions. These are warriors that each have a unique set of attributes and abilities so that you can find one whose style best suits you and then get to mastering them. Other than that, Quake Champions is Quake as you have always known it: fast, skill-based, and all about rocket jumps. The Railgun, Lightning Gun, and of course the Rocket Launcher are all included and as nasty as ever. As you should now be eager to get hopping around those stony wells, popping heads and elecrifying torsos with precise accuracy, we are giving away 5000 Steam keys for Quake Champions. These keys get you instant access to the free-to-play version of the game that will launch later this year. You’ll receive theRanger as the base Champion, plus all the maps and modes, while other characters and skins can be bought in-game if you so wish. If you were to buy this right now it would cost you £19.99 so it’s quite the saving. All you have to do to get a code is enter the competition via the widget below.Every action you complete is worth one entry into the giveaway with the more actions you complete increasing your chanes of winning. We’ll also need your email address so we can send you a code upon winning – we won’t send you spam, we promise. Please read ourterms and conditionsbefore you enter.